Petra was a well-developed city and contained many of the buildings and urban infrastructure that one would expect of a Hellenistic city. 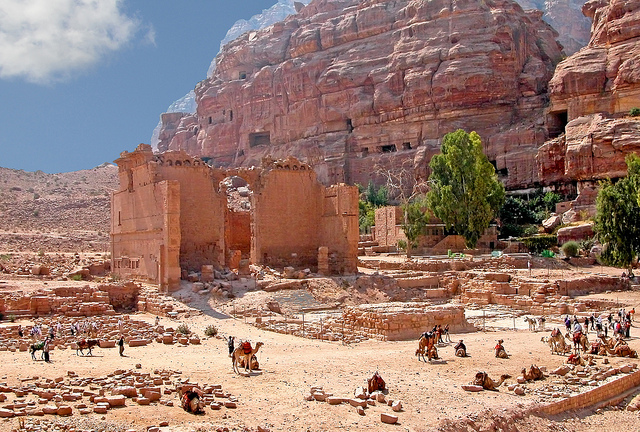 Recent archaeological work has radically reshaped our understanding of downtown Petra. 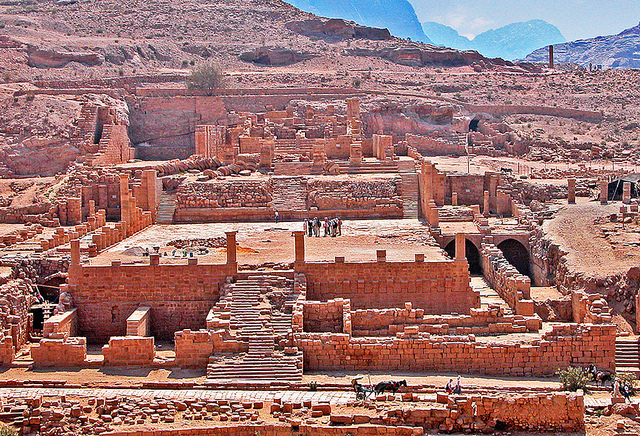 Most of Petra’s great tombs and buildings were built before the Roman Empire annexed it in 106 C.E. 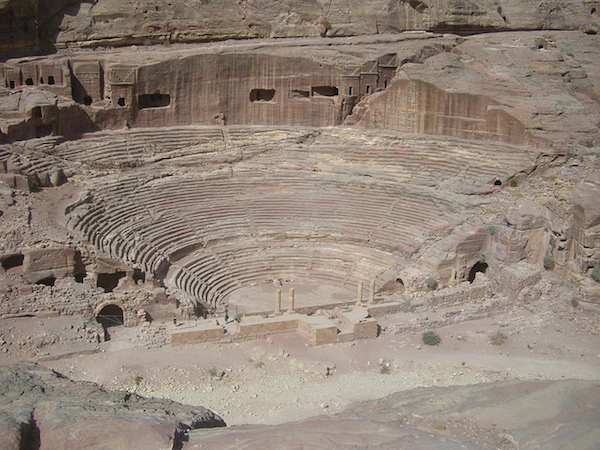 Petra had a large theater, which was probably built during the reign of Aretas IV (9 B.C.E. – 40 C.E. ), as well as a monumental colonnaded street. Important buildings graced both sides of the Wadi. On the south side of the street was a nymphaeum (a shrine consecrated to water nymphs, often with a fountain) and a series of monumental spaces, which were once identified as markets. The so-called Lower Market has recently been excavated and shown to be a garden-pool complex. This stood adjacent to so-called Great Temple of Petra. Within the cella, or inner sanctuary room, of the Great Temple, a series of stone seats were discovered; this may suggest that the structure was not a temple, but an audience hall at least for part of its history. Baths were also located in its vicinity. Opposite the so-called Great Temple is the Temple of the Winged Lions, from which a unique god block of a female goddess, was recovered. 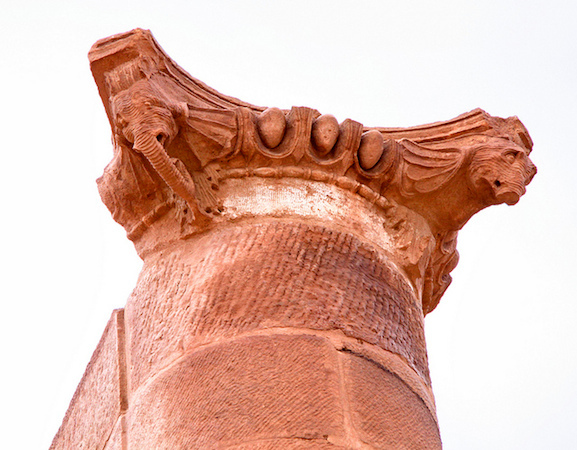 Column capitals at Petra are truly unique in part for their carvings of winged lions and elephants. Just to the west, past a gate in a temenos, or sacred precinct, was the Qasr el-Bint, the most important temple in the city. It was also probably built under Aretas the IV, but we do not know to which gods the Qasr el-Bint was dedicated. Petra is also filled with more mundane architecture, including domestic residences, as well as the all-important water-catchment and storage systems that allowed life and agriculture to flourish here. Petra is often seen in isolation; in fact, it was one of many Nabataean sites; the Nabataean lands stretched from the Sinai and Negev in the west, as far north as Damascus at one point, and as far south as Egra, modern-day Madain Saleh, in Northern Saudi Arabia, which also had numerous rock-cut tombs, amongst others. At Egra an inscription attests to the presence of a Roman Legion at the site, marking the city as the southern most boundary of the Roman Empire in the Antonine Era. Khirbet et-Tannur was a major sanctuary in central Jordan; many of its reliefs are in the Cincinnati Museum of Art today. The Nabataeans took an active role in their architectural and artistic creations, drawing upon the artistic vocabulary of the Hellenistic world and the ancient Near East. Rather than slavishly copying either one of these traditions, the Nabataeans actively selected and adopted certain elements for their tombs, dining pavilions, and temples to suit their needs and purposes, on both the group and individual level. 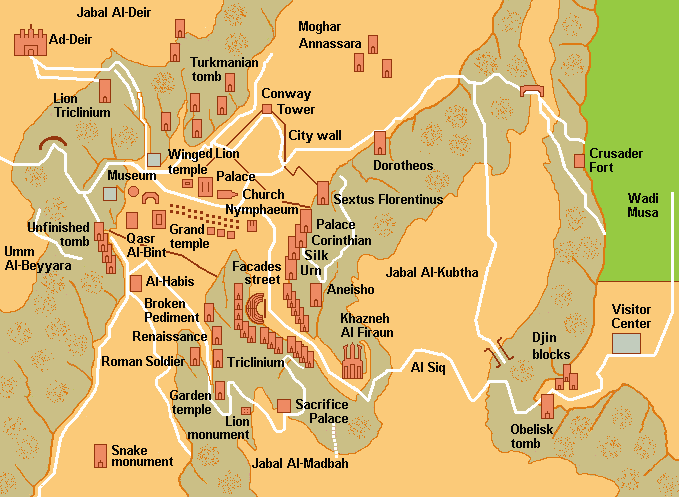 Indeed, the Treasury and the Monastery could only have been conceived of and executed in Petra. Cite this page as: Dr. Elizabeth Macaulay-Lewis, "Petra: urban metropolis," in Smarthistory, August 8, 2015, accessed April 22, 2019, https://smarthistory.org/petra-urban-metropolis/.